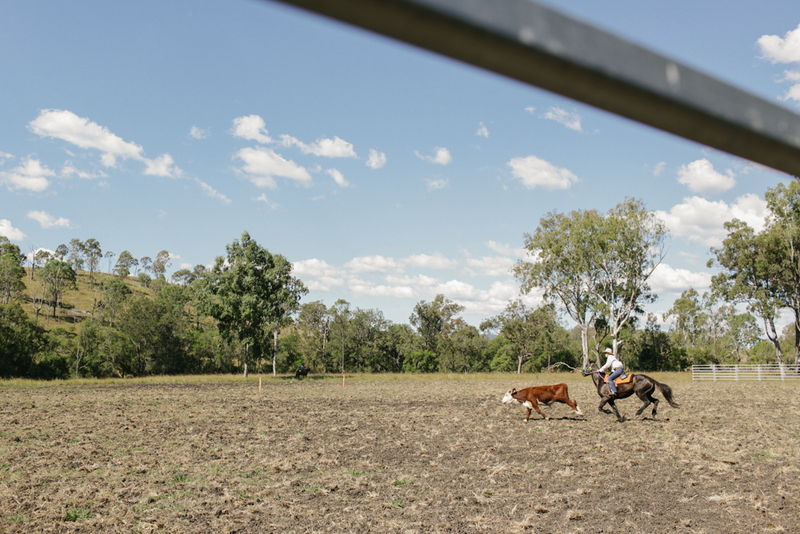 Looking for a true-blue cattle ride? Look no further, we have the ride for YOU! 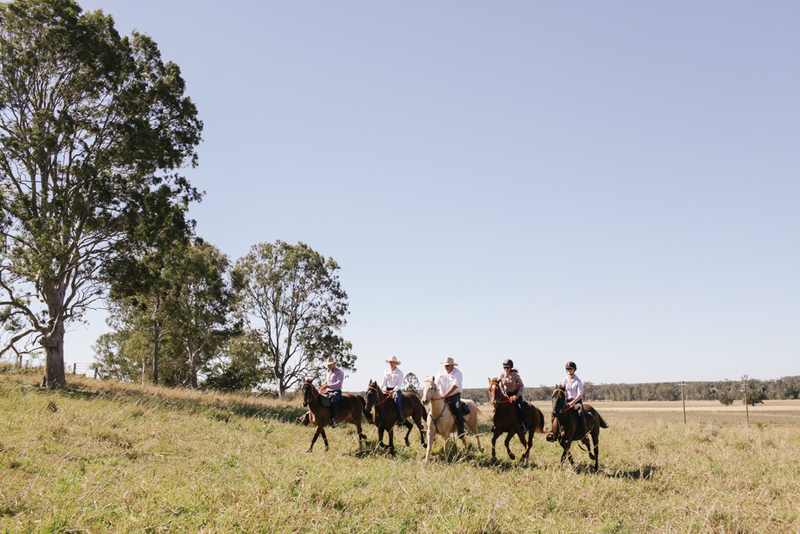 This five-day ride begins at a cattle property owned by guide and host, Andrew McCarthy. 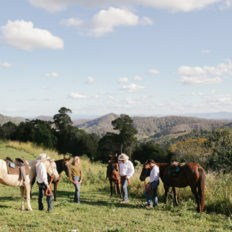 The property skirts Mount Goomboorian, east of Gympie in the south east corner of Queensland (3 hours drive from Brisbane). 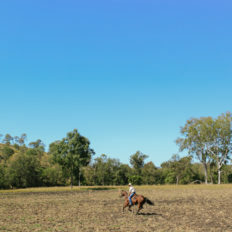 For the first two days you’ll ride this patch of paradise, slipping into the day-to-day runnings of a small-scale cattle property. 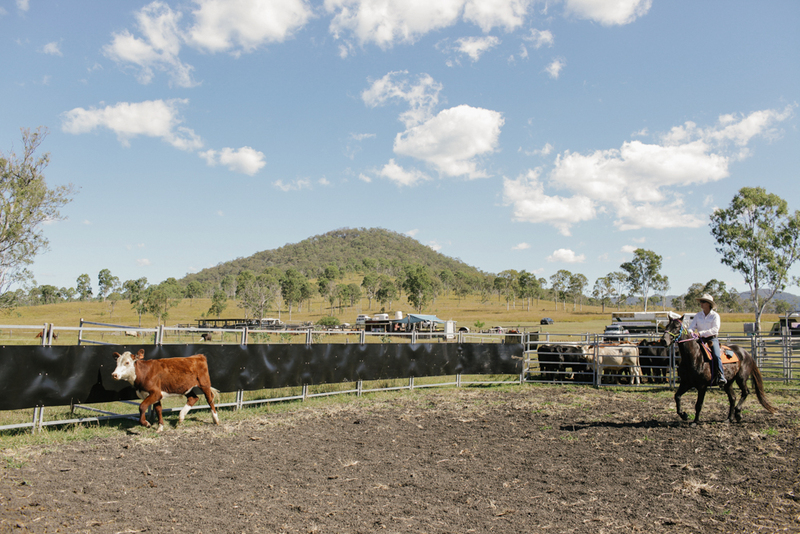 During these two days you’ll muster, draft and process cattle in the yards and learn to drench, brand or draft, depending on the time of year. 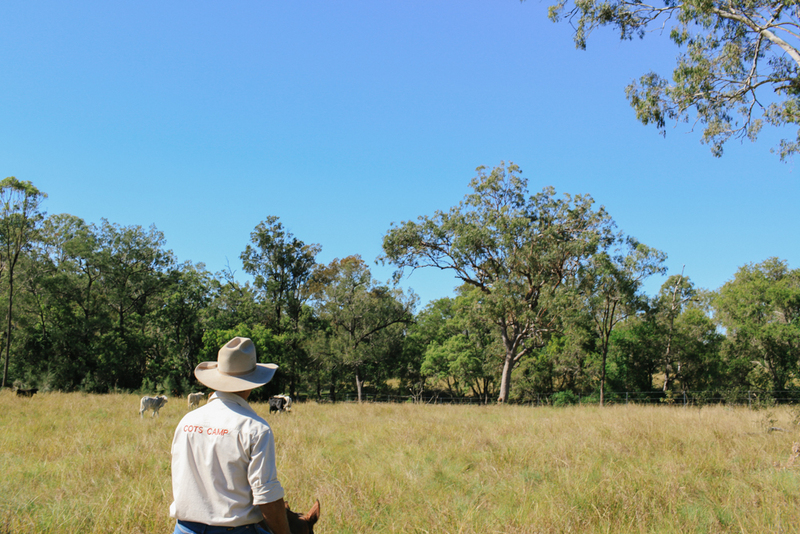 This is all conducted as a hands-on experience where you’ll get down and dirty and catch a glimpse of everyday life for a grazier. 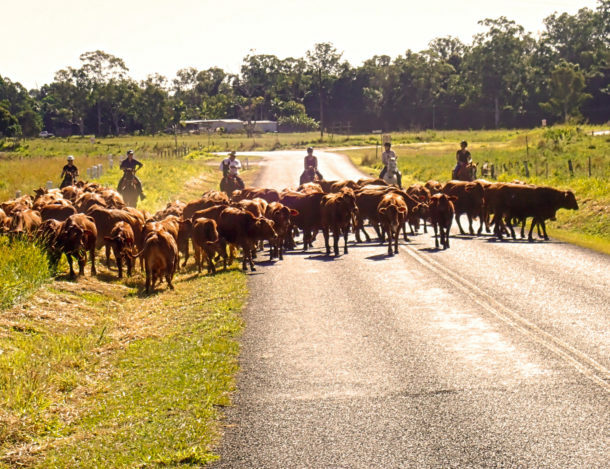 Not to mention the deep satisfaction you receive after a day in the saddle mustering, then sitting around a blazing camp fire under a canopy of stars with a beer in hand and some hearty camp tucker in your belly. 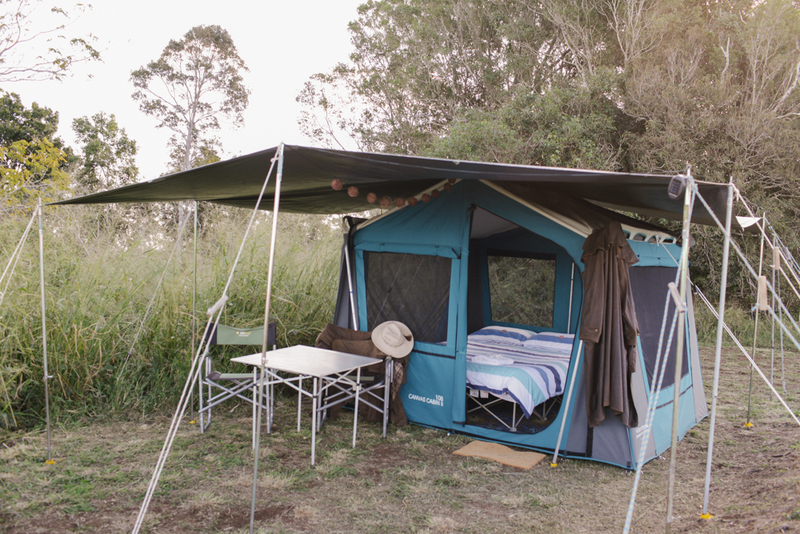 For the first three nights you’ll literally be camping on top of a mountain, Mount Goomboorian to be exact. You’ll wine and dine most nights out under the stars around a campfire, a wonderful change to your normal dinnertime routine. 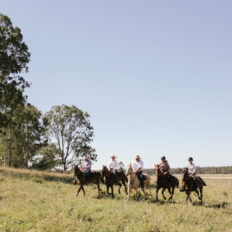 For the final two days of the itinerary, you and your horse will be transported up the road to Rod Cotter’s property near Widgee. 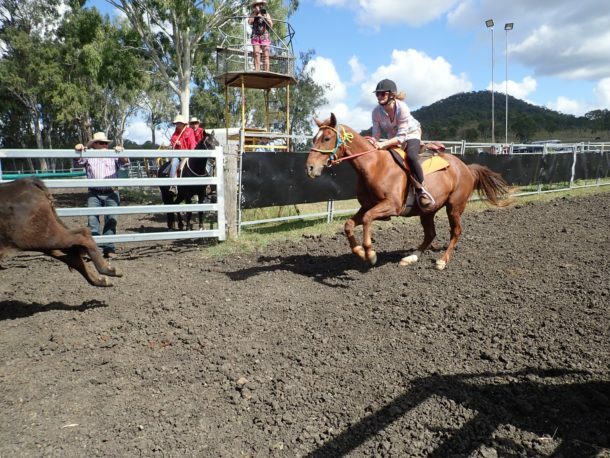 Rod Cotter will break down the sport of campdrafting into sections that you’ll master with one-on-one tutelage before putting it all together in a safe and fun environment. 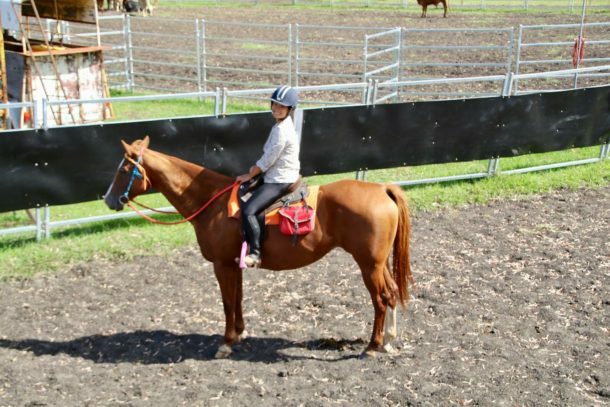 Rod is a kind, patient and expert teacher who can teach everyone from beginner to experienced riders. 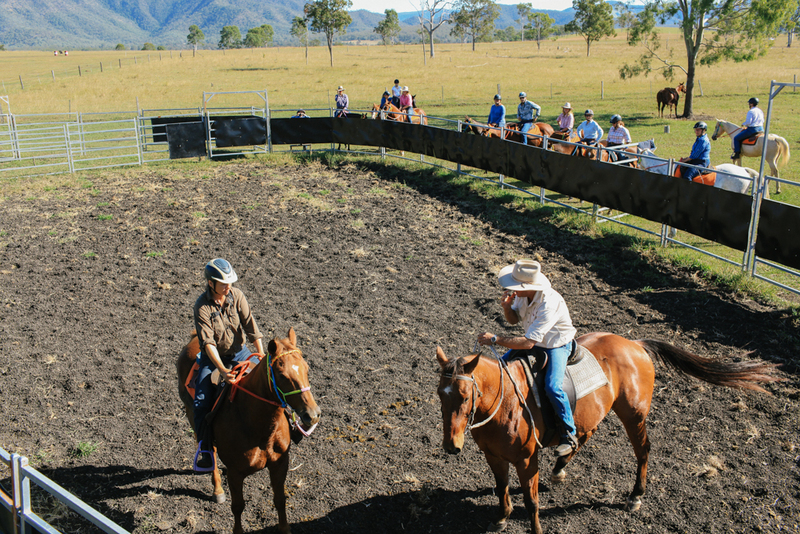 By the end of the two-day clinic you’ll have raced a couple of cows out of the camp and around a peg or two, and hopefully through the finishing gate. 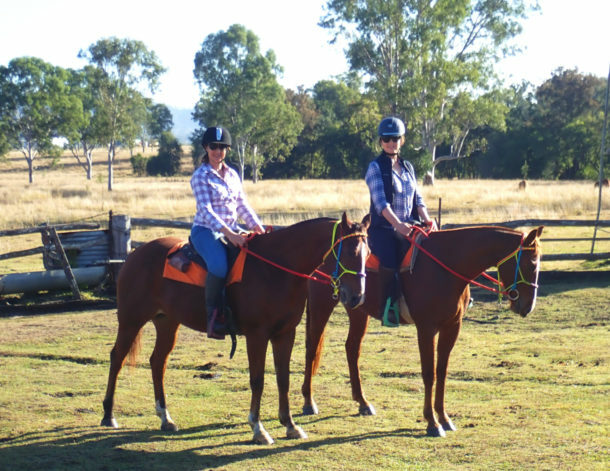 SO if you’ve always wanted to run away to the bush and be a jillaroo or a jackaroo, then THIS is the ride for you! 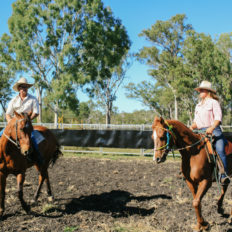 Horse Breed:The majority of the riding herd are Quarter Horses (geldings), all with close connections to one of two famous Quarter Horse stallions: Acres Destiny and Doc’s Spinifex. 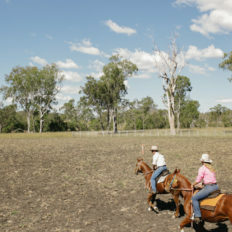 Pace:The pace can vary from a walk right through to a canter, depending on the terrain. 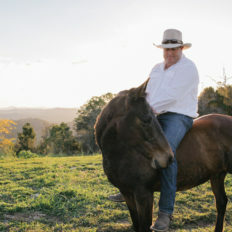 Type of tack:Australian made swinging fender stock saddles. Group size:A minimum of 8 and a maximum of 10 guests. 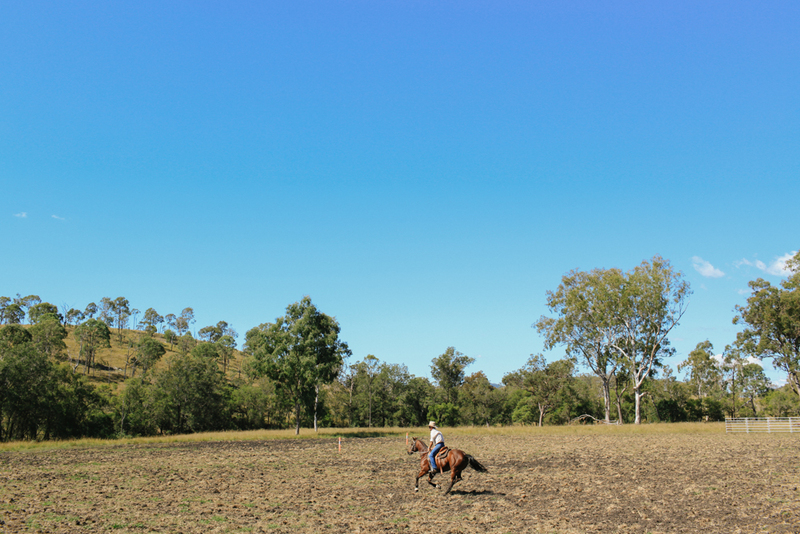 Time in Saddle:On average 5 to 6 hours per day. 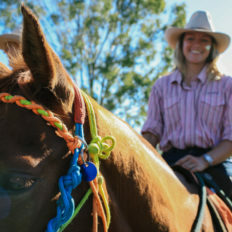 Riding Ability:Suitable for all riding abilities from beginner through to advanced. 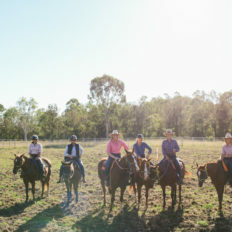 *If you are a beginner rider, you’re expected to be capable of riding your horse at a walk and posting/rising to the trot, and be willing to try cantering. 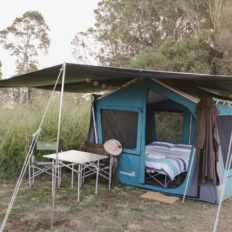 Accommodation:Tents with all bedding and towels provided. Hot camp showers and long drop toilet a short walk from the campsite. Ride Length:5 days, 5 nights. 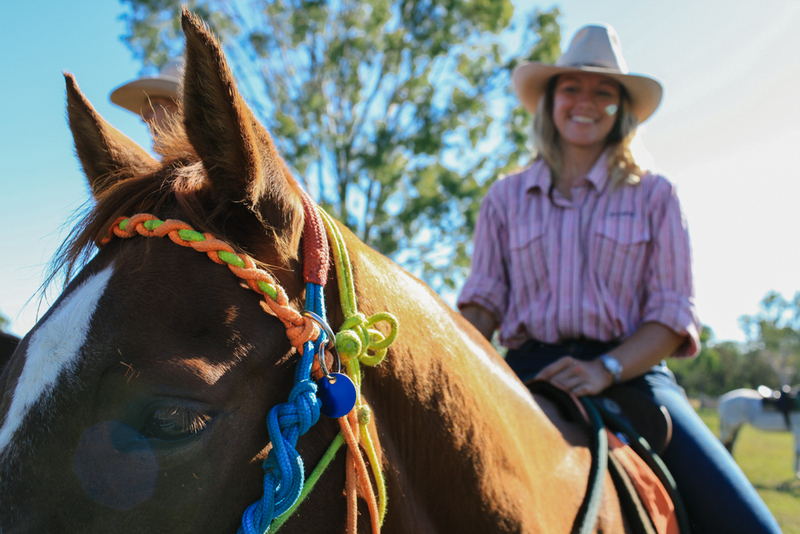 Inclusions:The price includes meals, accommodation, riding and campdraft clinic fees. 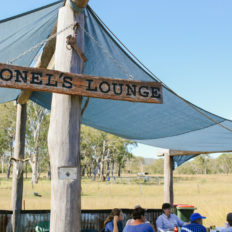 Exclusions:The price does not include transfers to and from the ride (available for $200 AUD per person round trip), alcohol, flights or travel insurance (compulsory). 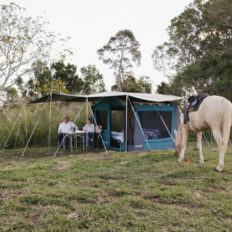 $3,000 AUD - Twin Share ?Happy to share with another solo traveller of the same gender. The price includes meals, accommodation, riding and campdraft clinic fees. 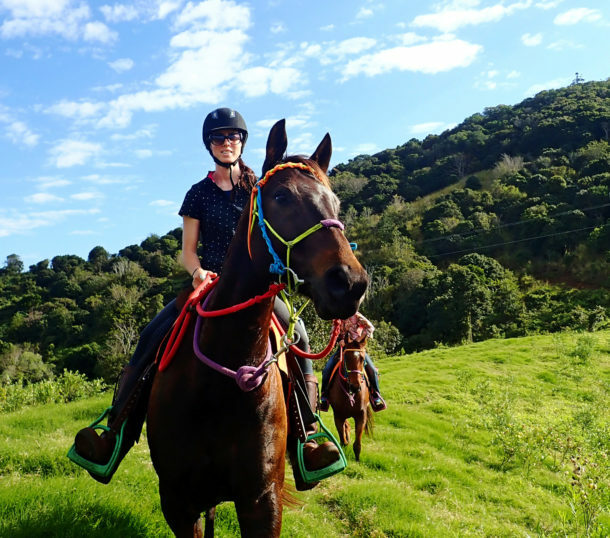 The price does not include transfers to and from the ride (available for $200 AUD per person round trip), alcohol, flights or travel insurance (compulsory). 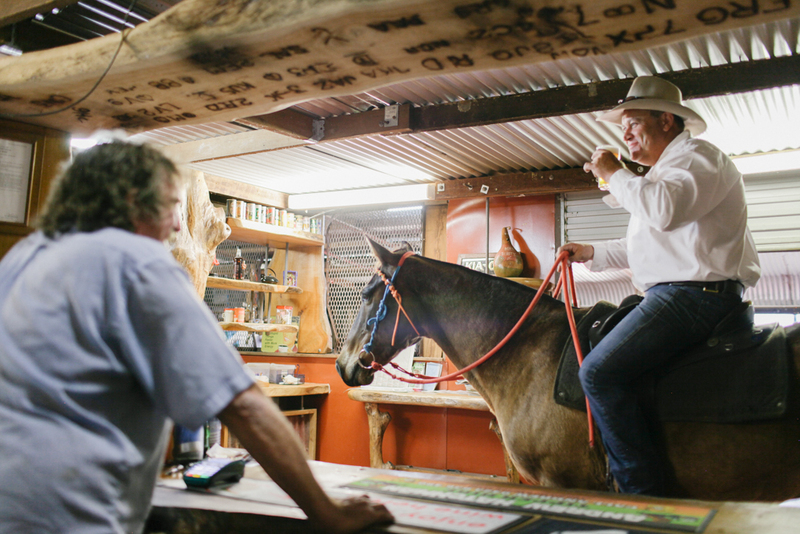 You’ll arrive at the Sunshine Coast Airport in Maroochydore before 1pm and be greeted by your host, Andrew McCarthy, or a member of his team and transferred to his family property COD-N-UP, with a small detour to pick-up your alcohol on the way – if required. After arriving at COD-N-UP you and your luggage will be driven to the top of Mount Goomboorian, which you’ll call home for the next three nights. 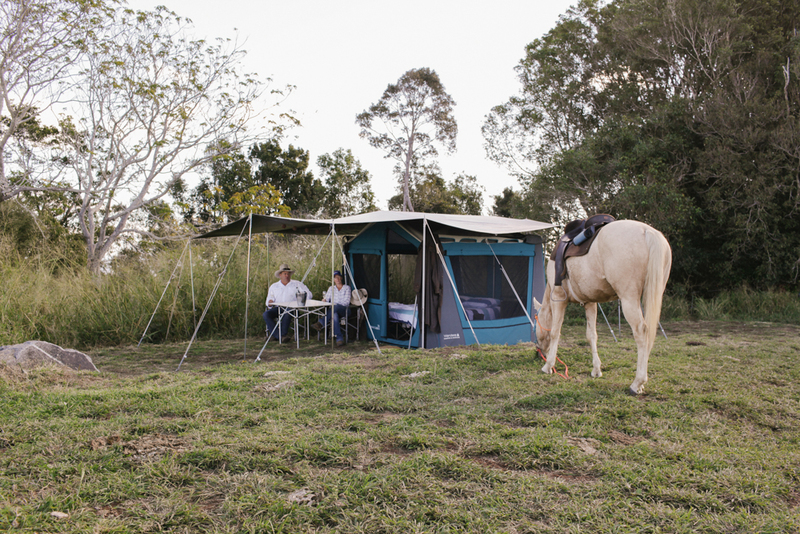 It’s hard to explain the vista until you see it with your own eyes, but let me try, it boasts 360 degree views stretching to the west and to the east where you can see the sand dunes near Noosa. 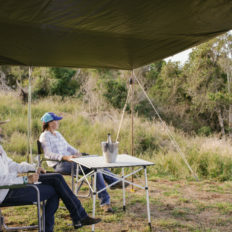 It’s an incredible campsite where you’ll enjoy true bush comforts, including a tent large enough to swing a cat in, stretcher bed with all linen provided, bedside table. Trust me – you’ll be more than comfortable. 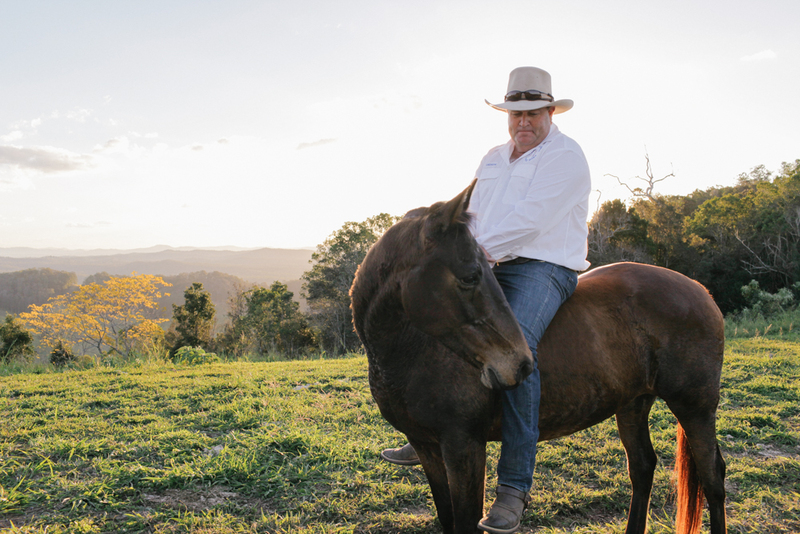 On sunset you’ll have the pleasure of enjoying a Liberty riding demonstration by Andrew. Tonight’s meal will be a camp oven roast before you retire to your spacious tent for a good night’s sleep. 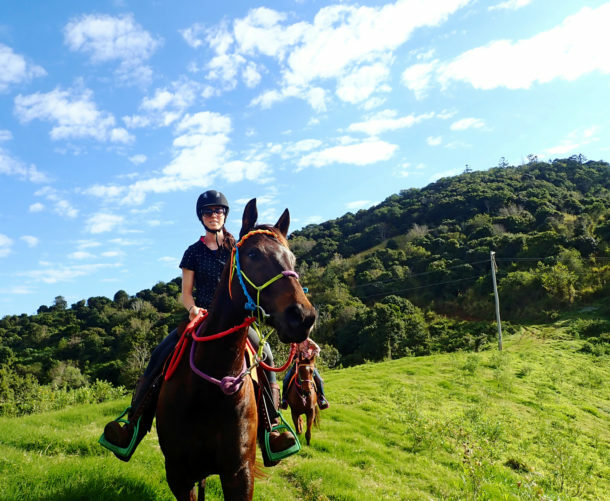 After waking to a spectacular sunrise over the Pacific Ocean and enjoying a hearty cooked breakfast, you’ll be transported off the mountain and introduced to your horse for the five days. 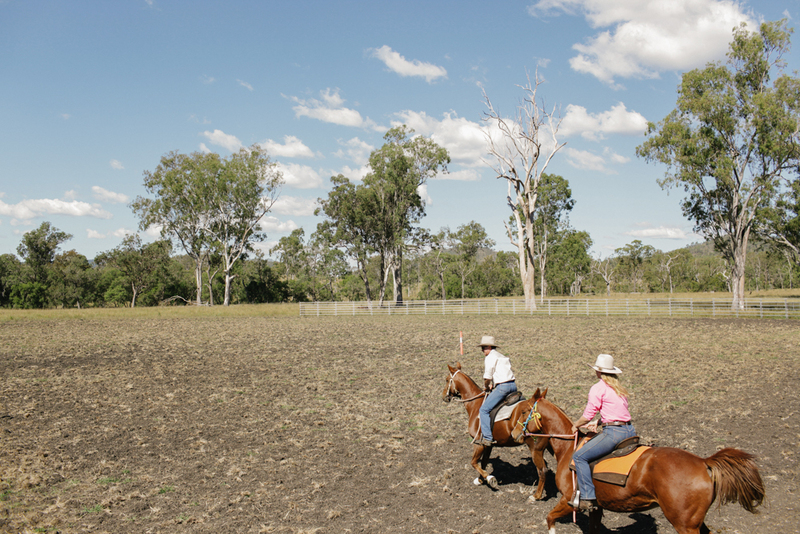 Once you’re comfortable in your swinging fender saddle you’ll commence your riding adventure through cattle grazing country. 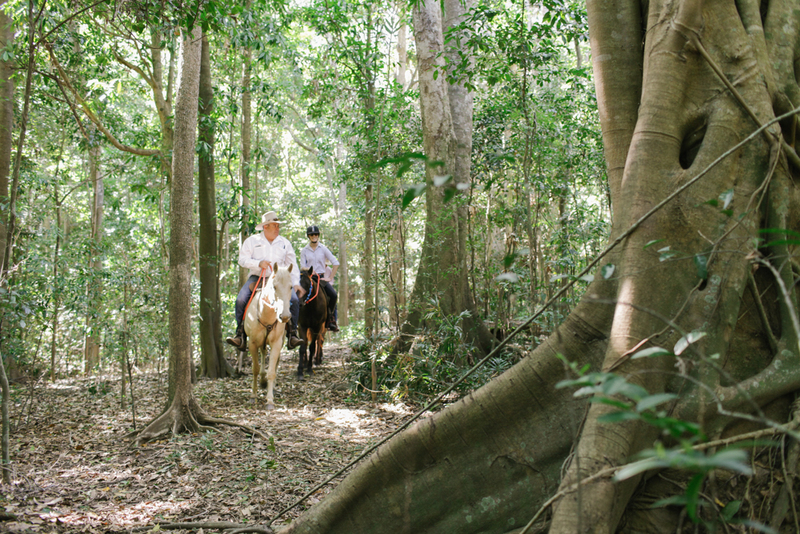 With plenty of opportunities to enjoy a trot and canter if you wish, you will venture through vine scrub, across creek crossings and through a stand of Eucalypt timber where you will have a chance to spot a koala (trust me – your chances are good!). 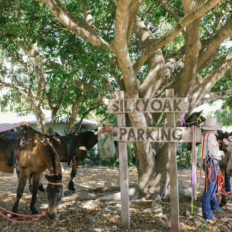 After the morning’s ride you will arrive at Silky Oak Tea Gardens (pictured above), your lunch location. 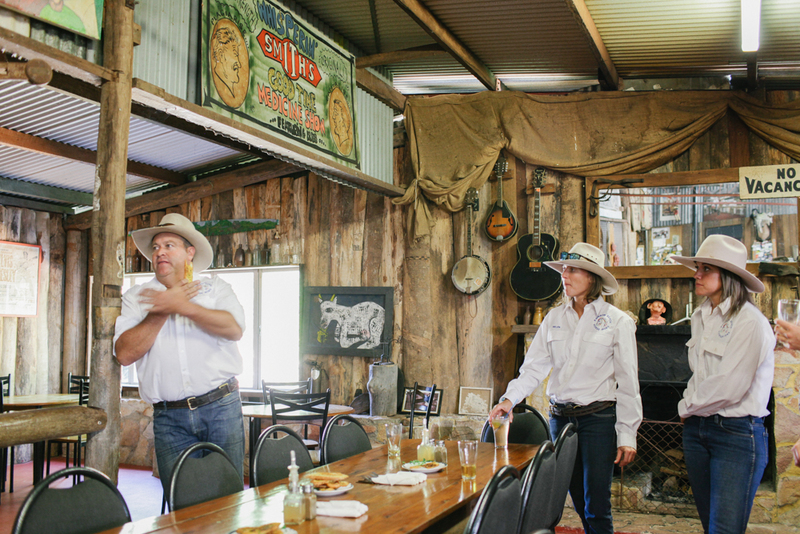 Here you’ll literally step off your horse and walk into a professionally run, rustic country pub dining experience. 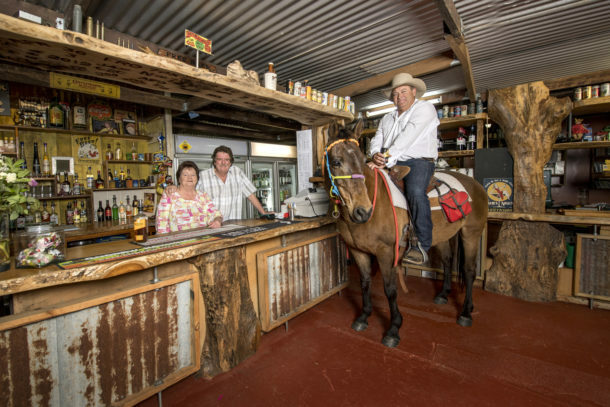 Now you’re in for a real treat here globetrotters because at Silky Oak you will be given the opportunity to have a photo of yourself on a horse IN A BAR (yes, you read that correctly!). An awesome keepsake to take home and cherish of your riding adventure and more importantly social media bragging rights! Once all the modelling contracts have been fulfilled you’ll sit down to enjoy a hearty meal. 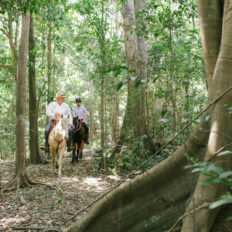 Following lunch you’ll get lost in pristine scrub and virgin rainforest, possibly spot another Koala and eventually finish at your Mount Goomboorian campsite for a sundowner. 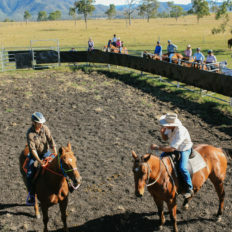 After a long but fulfilling day in the saddle and with your bellies full from dinner, you’ll retire to the blazing warmth of a camp fire and enjoy a whip-cracking demonstration, a photo viewing opportunity of your day’s modelling and discussions of the following day’s activities before falling into a wondrous and peaceful slumber. 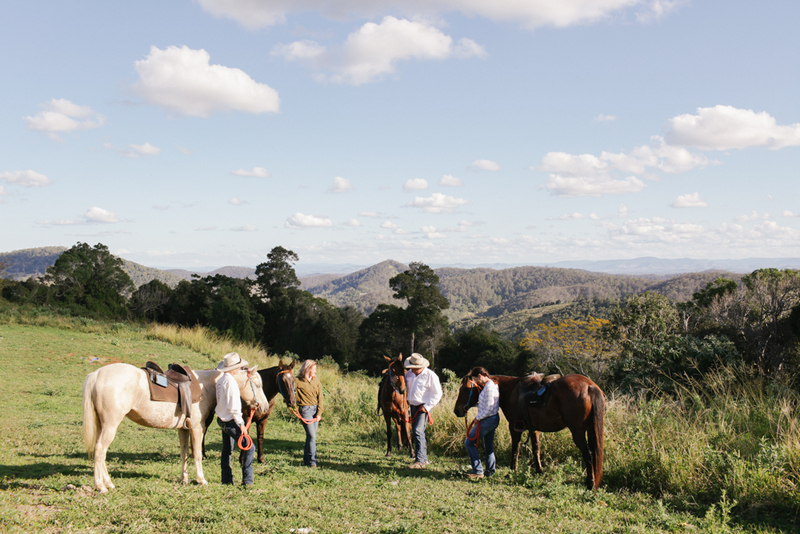 Today you’ll ride off the mountain, mustering cattle as you go. 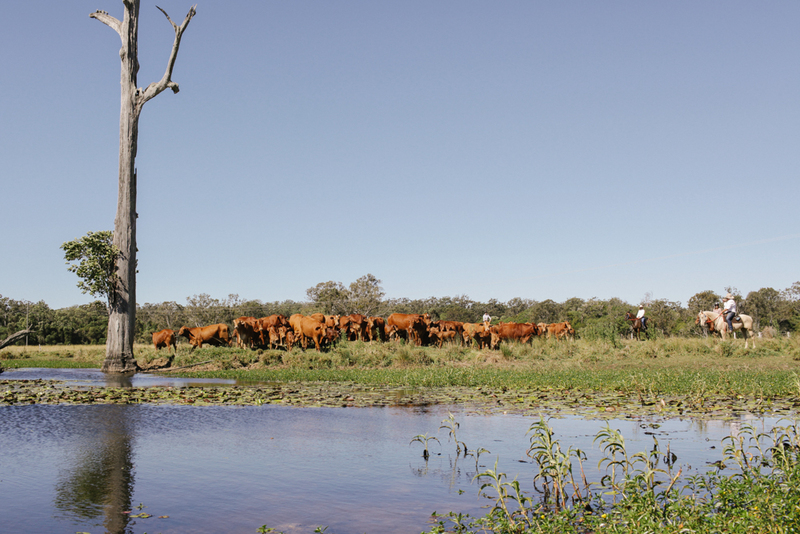 Once yarded, the cattle will be processed exactly the way it’s done in a real cattle station environment. 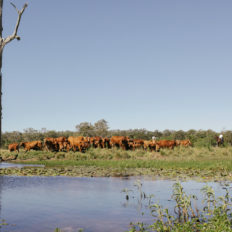 Your guide, Andrew McCarthy, has previously run about 17,000 head of stock on a cattle station in WA that was a bit less than a quarter of a million acres, so he’ll be able to demonstrate to you the skills and procedures used in daily life on the stations. 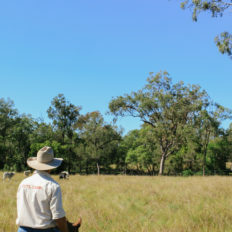 Stock will be branded, dehorned, ear marked, ear tagged, castrated and treated for tick and fly as required. 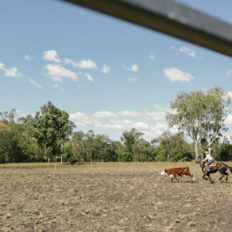 This is a dinky- di, real life cattle work experience globetrotters, dirt moustaches included! 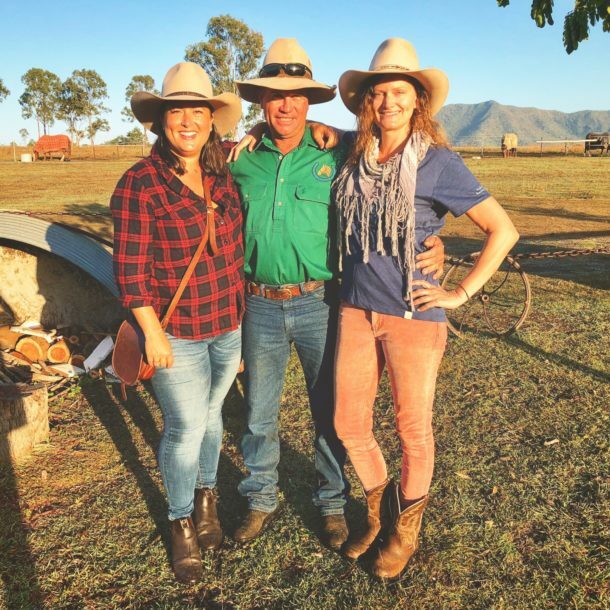 Following the day’s work you’ll head back up the mountain where you will reminisce on the day’s activities and enjoy another night of breathtaking views, campfire yarns, whip cracking and delicious, satisfying camp oven food. There is also the opportunity to brand your name into a piece of rough sawn timber with fire brands for you to help remember the occasion (please note, this will be an additional cost of $100 or $120 depending on the piece of timber you choose). 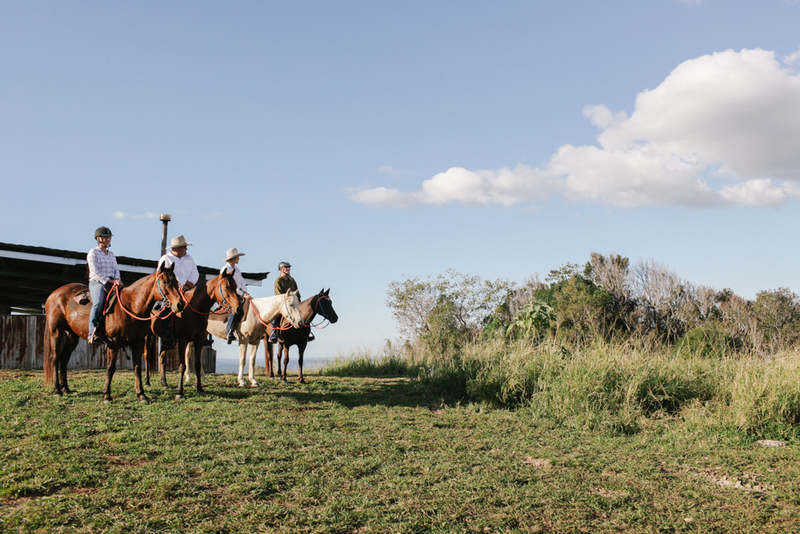 After another stomach-filling breakfast, it’s time to pack up and leave the mountain campsite onto your next adventure – campdrafting! 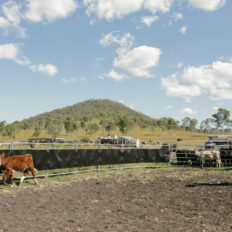 The horses will be loaded onto the truck and taken to ‘Cots Camp’ at Widgee. 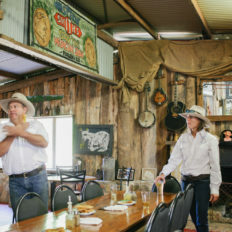 En route you’ll enjoy an early lunch stop for a multi award-winning pie at Ross Creek Store before arriving at Rod Cotter’s property at Widgee to commence the cattle mustering at 1pm. 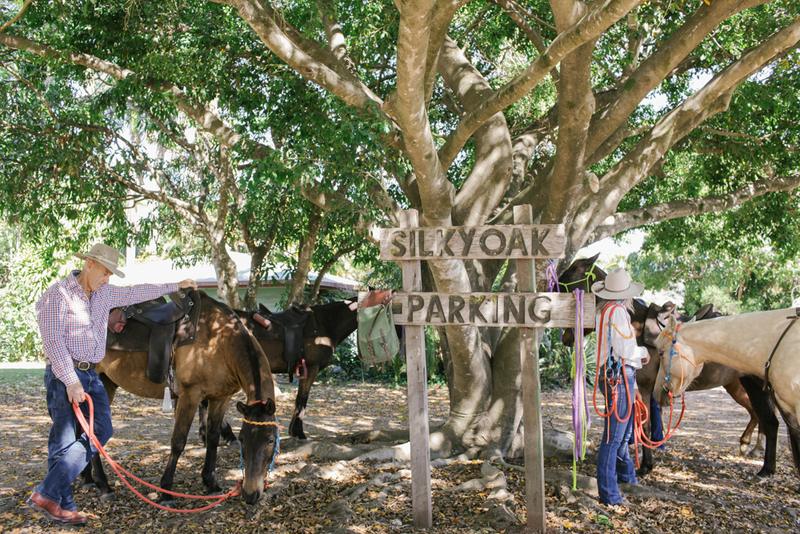 At the conclusion of mustering and possibly some drafting in the yards, you’ll be reunited with your luggage and shown to your tent. 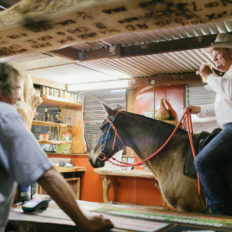 Tonight we advise you to get some early shut-eye so you’re ready for the next two days of campdrafting! 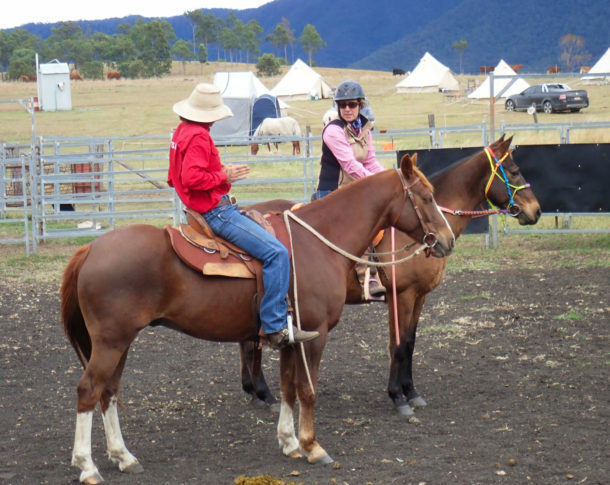 It’s campdrafting time globetrotters – YAY! 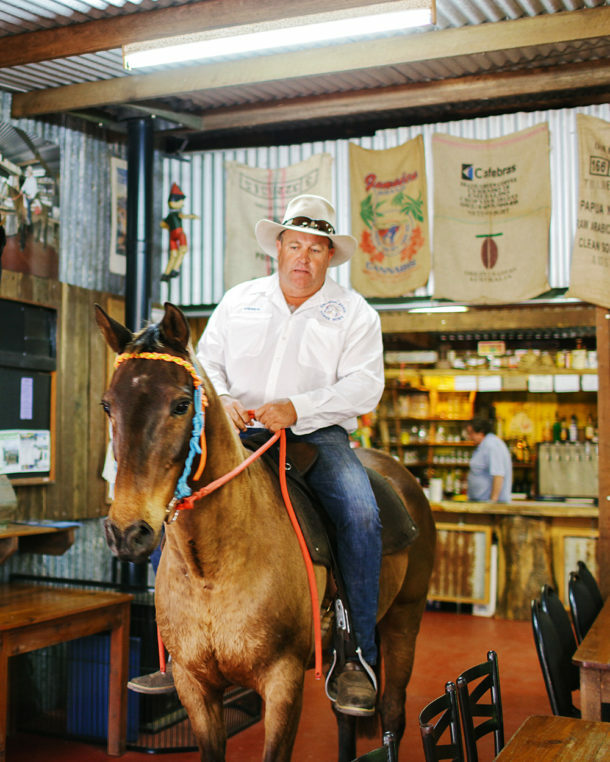 After breakfast you’ll enjoy a full day’s campdrafting clinic with quality instruction by none other than campdrafting royalty, Rod Cotter. 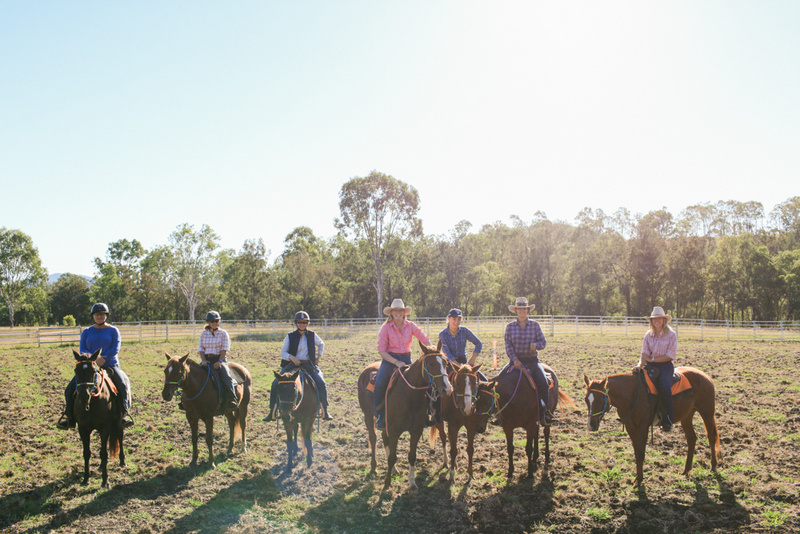 You’ll learn the in’s and out’s of this fast paced, exhilarating discipline and try your hand at the sport on board your trusty, knowledgeable horse that you’ve already bonded with for the past three days. 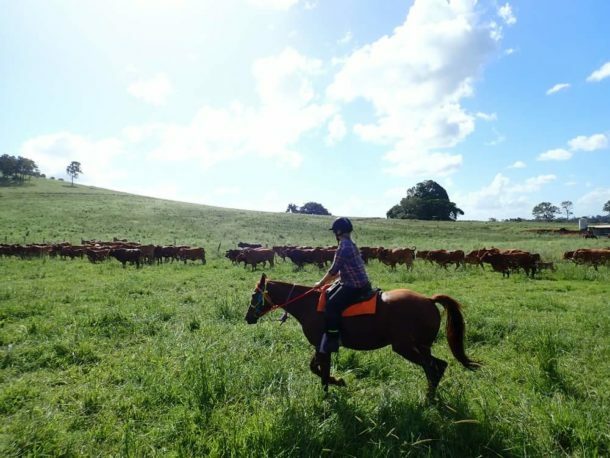 I guarantee you’ll spend the entire day grinning from ear to ear as you transform into a cowboy or cowgirl and chase after some cows. 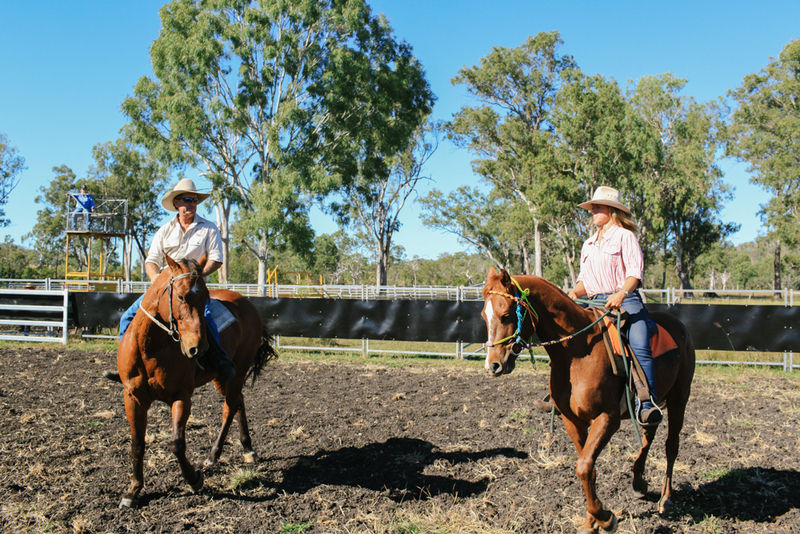 What is so special about this clinic is Rod has broken the sport up into easy to manage sections from teaching your horse to cut out properly from the camp, beast selection and going through the rules. 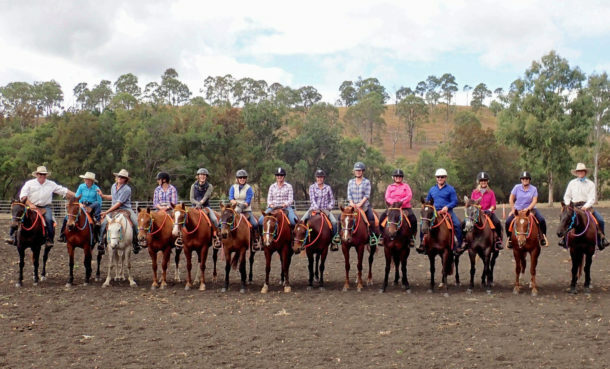 Trust me, you’re not thrown into the deep-end, this clinic is perfect for beginners to experienced riders who have been campdrafting all their life. 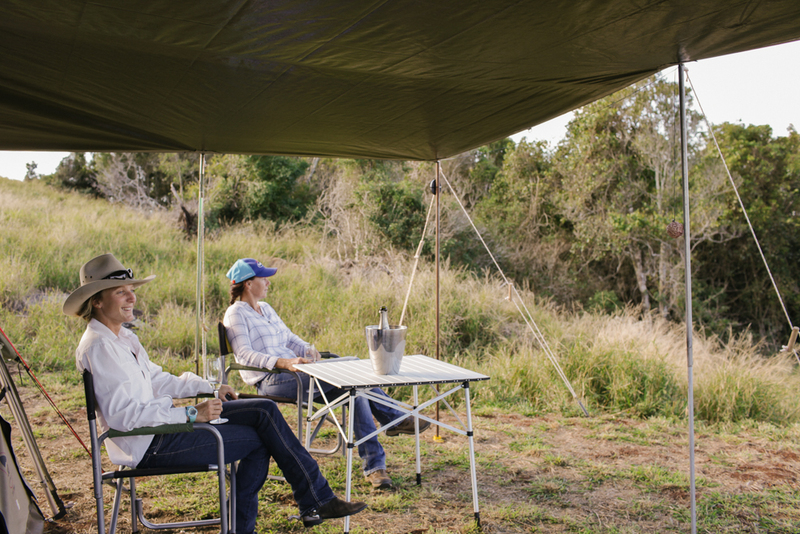 With a full day’s clinic under your belt and another hearty meal for dinner, you’ll collapse into your tent dreaming of cows! Today you’ll get the opportunity to continue practicing what you learnt yesterday as you try your hand at some more runs. Rip and tear around the course, chasing after your beast at speed. The final part of the day is a friendly competition as judged by Rod, with trophies for first, second and third. 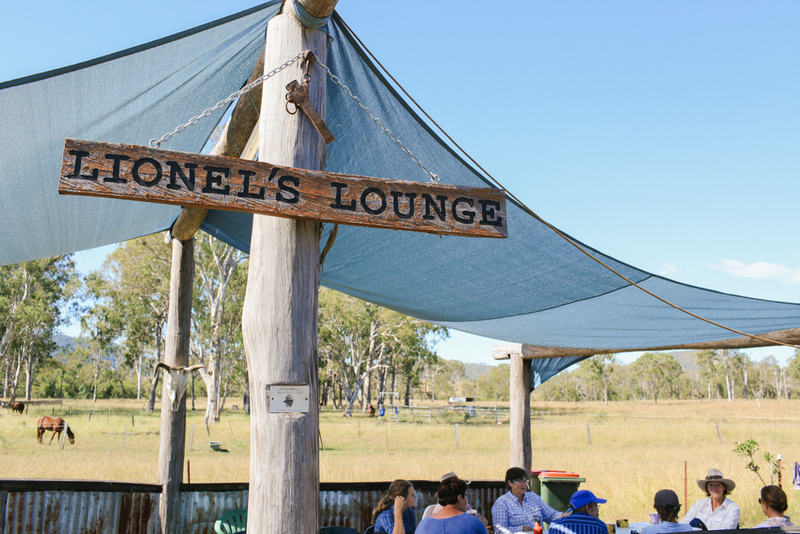 After lunch you will be transported back to the Sunshine Coast Airport, arriving in time for flights departing after 4pm. For those who drove you’ll also bid farewell to the team and head off after lunch. 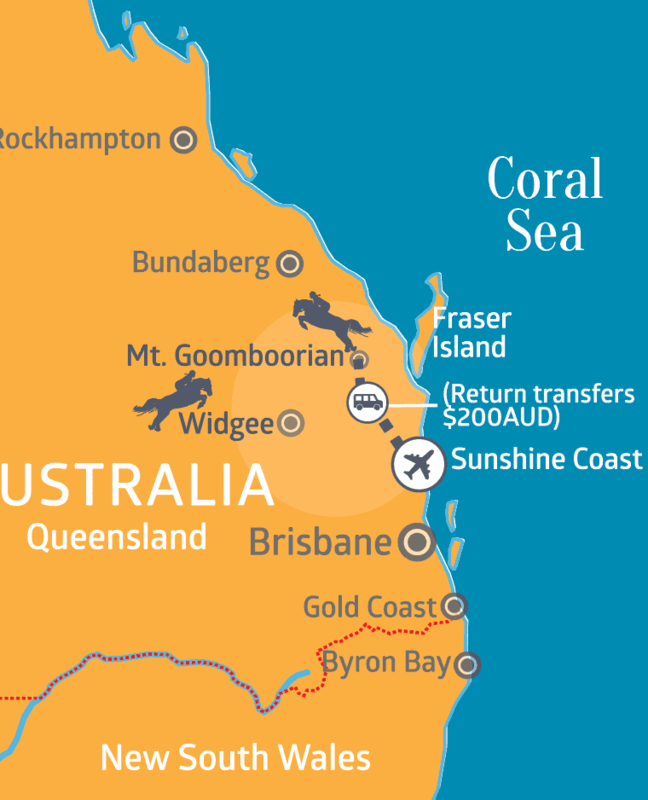 Round trip transfers from the Sunshine Coast Airport (Maroochydore) are available for $200 AUD per person on arrival and departure day only. Guests need to arrive no later than 1pm on day one, and departing flights are to be booked after 4pm on the final day. Please note, due to varying arrival times lunch is not included on arrival day.